In cyber security the strategic goals are often clear, while the methods to achieve those goals is anything but. This webinar introduces Damrod’s Cyber Strategic Framework that applies military analysis to cyber security challenges. Aimed at security teams trying to implement high level goals in the real world, this talk focuses on effects based planning that integrates disparate elements of IT and security into a cohesive package. Defending the network is about more than technology. Analysis and leadership are critical elements of an effective cyber defense. You will leave this webinar better equipped to develop the tactics that make strategy a reality. Griff is trained as a Canadian Infantry Officer and is a holds a Master’s Degree from the LSE. Unable to find “real” work, he got into software development as a Scrum Master, leading the development of a web based application. This experience fostered an interest in cybersecurity, and Griff went on to a boutique start-up providing application security to Fortune 500 companies. 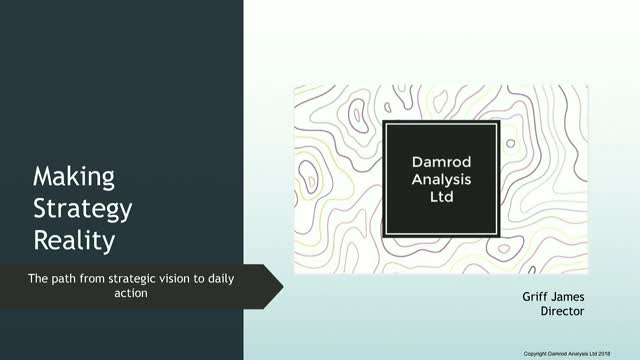 Frustrated by the disconnect between technologies and poor analysis within cyber security, Griff founded cyber defense firm Damrod Analysis in 2017.